For a limited time, Wingstop is unveils new Brazilian Citrus Pepper as their latest wing flavor. 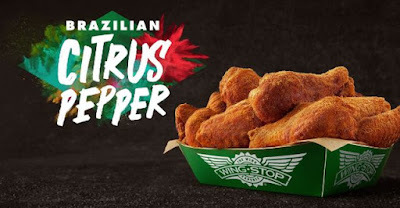 According to the chain, the dry rub flavor offers an "exotic twist" to their Lemon Pepper flavor with a combination of "zesty citrus and a punch of piri piri pepper." In terms of heat, the new flavor slots between Wingstop's Original Hot and Louisiana Dry Rub. The piri piri pepper is a spicy chili pepper that is the main ingredient to piri piri sauce (also spelled as "peri peri"), a hot sauce with Portuguese origins.